“The way you guys travel, you obviously make a lot of money” (Often said in a bitter, condescending way). Here is the truth: Yes, the combined income of my husband and I is actually pretty good, I won’t hide that fact in case someone tries to come back with something from that later. But here is another fact: We live off of less than $40,000 a year. Why? Well, we have several financial reasons for this (putting money away for the future, early retirements, etc.) but a big part of that is that for every penny saved is a penny to put towards our next trip. And then I hear the other end of the spectrum and often get made fun of the way we (don’t) spend money. So what is it people? Are we rich or cheap? Pick one side already. When moving to Germany, we had the option of getting a nice sized place to live in. Instead, we chose to find a small apartment with no garage or parking and barely enough room to fit all of our junk into. By doing this instead of getting a townhome or house, we have saved thousands upon thousands of Euros. (Guess how many trips we have squeezed just from that alone!?). Sure, having a big home is great, but if you REALLY want to travel, could you get rid of your pool and gym access apartment or condo instead? Likewise, in the summer, a fan in the window and a cold washcloth can beat the heat instead of the A/C. Here in Germany, we don’t even have an air conditioner (mostly because of the climate here) but in Nebraska, we did the same thing. It would take several consecutive days of 100+ degree weather plus humity to get us to flip the switch. Even when we do turn it on, it is just enough to not suffocate from the humidity. We constantly price shop, even on places like amazon! We will wait to buy things (even small purchases) until it is cheaper. Yes, it is time-consuming, but it can pay off. We buy in bulk on many products. Sure, I have no idea what I’m going to do with 30 cans of coconut milk, but damn-it, I’m going to find out! You thought I was going to say we skip doing laundry, didn’t you? Well, lucky for you, we still do wash our clothes. However, we make our own laundry detergent and often hang dry our clothes instead of using the electricity for the dryer. We hoard hotel soaps and shampoos for personal use like they are going out of style. With crazy long hair, I need real products, but it’s been years since Andy has bough shampoo and soap. If something needs to be fixed, we try to do it ourselves before paying a professional (Google and Youtube truly can be a wonderful thing if you are willing to put in some time and effort and try something new). This is also true for when you are actually planning that trip that you’ve been saving for. 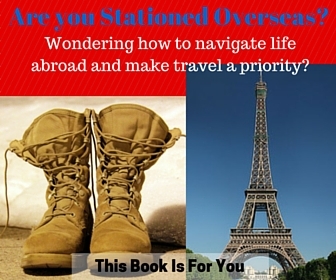 Try to do it all yourself (planning, booking, free tours etc) and you’ll save tons. I have an unspoken clothes shopping rule: If one article of clothing is more than $10, it is too much. Believe me, this has made for some interesting shopping trips with my girlfriends and I may not be the most in-style person on the block, but when I am having dinner in an exotic location, I don’t mind that my shirt isn’t the newest trend. My hairstylist hates me for this, but I get a cut MAYBE two times a year? I also cut Andy’s hair myself. 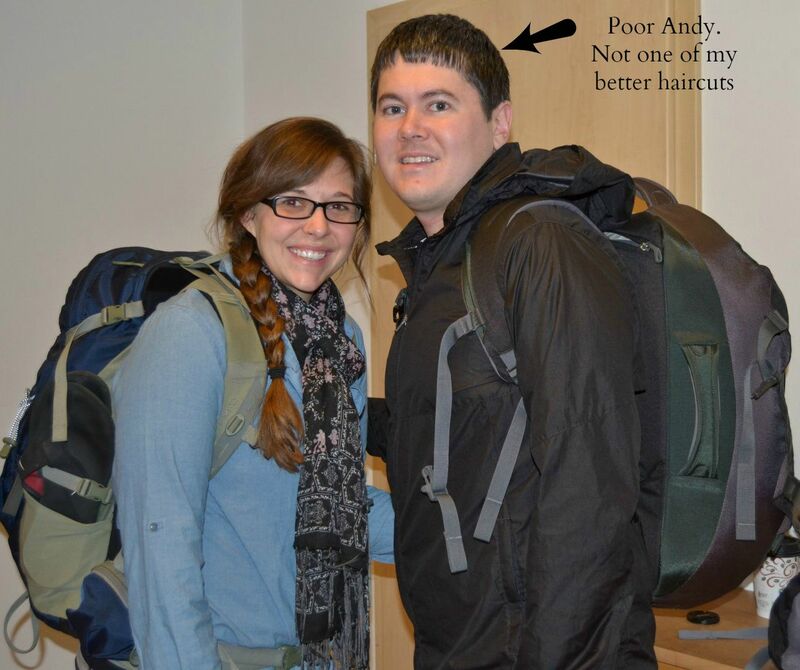 Once again, we may not win an award for “Best Hair” and Andy sometimes looks like a child accidentally took scissors to his head, but considering mine is in a pony most days anyway and he knows that hair grows, who cares? Estimating, this saves at least $200/year!!! We don’t have “tv.” Ok, yes. We have a physical TV, but we don’t pay for cable or even a provider at all. We watch anything we need through the internet saving us a MINIMUM of $300 a year. 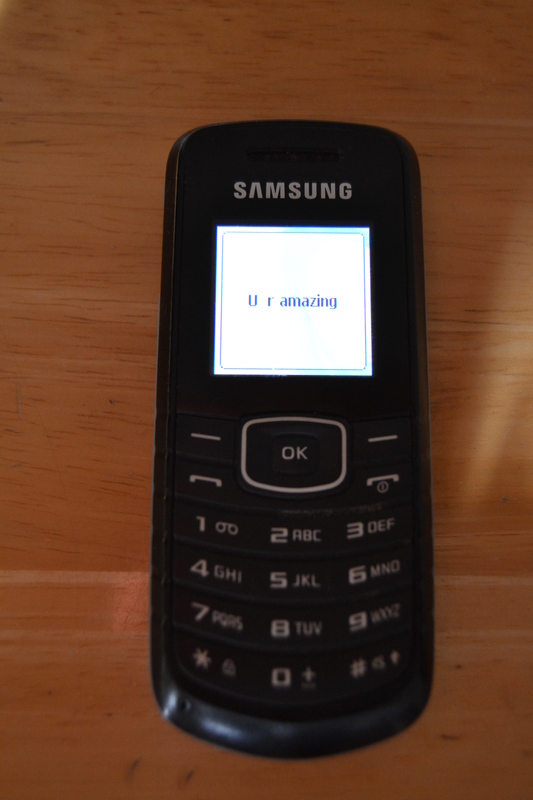 My phone is so smart, it knows how amazing I am, what else would I need in a phone? It cost me about 25 Euros to get the phone/sim card itself and RARELY, if ever use it and just put money on it as we go. I can put 15 Euro on my phone and have it last 4-5 months while others pay 80 Euro (UUUh, that is a Ryan Air flight to AFRICA right there!) a MONTH!! 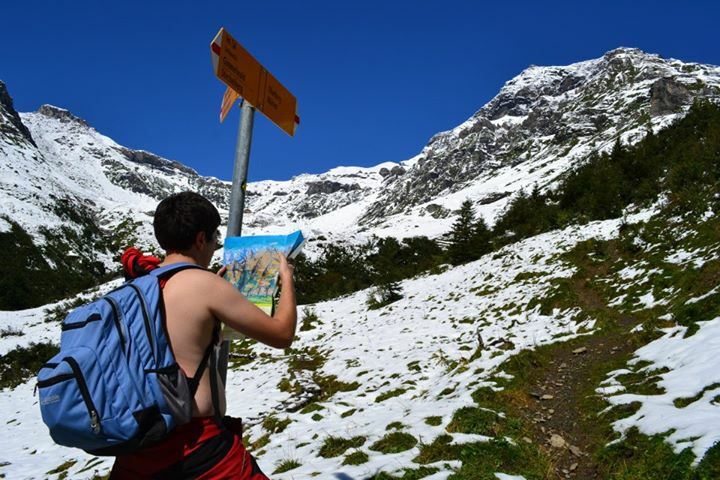 When traveling, we are willing to stay at hostels and other “cheap” places. While I do HIGHLY care about cleanliness, I am also willing to have a room the size of a closet, a hard bed and no breakfast and will only occasionally share a room with geckos if it means I can travel more or longer. Tripadvisor, Booking.com and AirB&B have become my best friends for finding great prices while not having to sacrifice cleanliness. (Yes, it can take hours upon hours of searching and cross-referencing hotels, but once again….a cheap stay in a clean room is worth it). 17) Not everyone has this luxury, but if you can, save money on interest by not taking out loans (cars, school, etc) and not having credit card debt. If we can’t pay for it in cash, we won’t charge it. That’s not to say we don’t take full advantage of credit cards and Travel Hacking, but we won’t charge what we don’t have. Great tips. We have been doing some of these but I think we will add a few more to our money saving list :). Thank you! 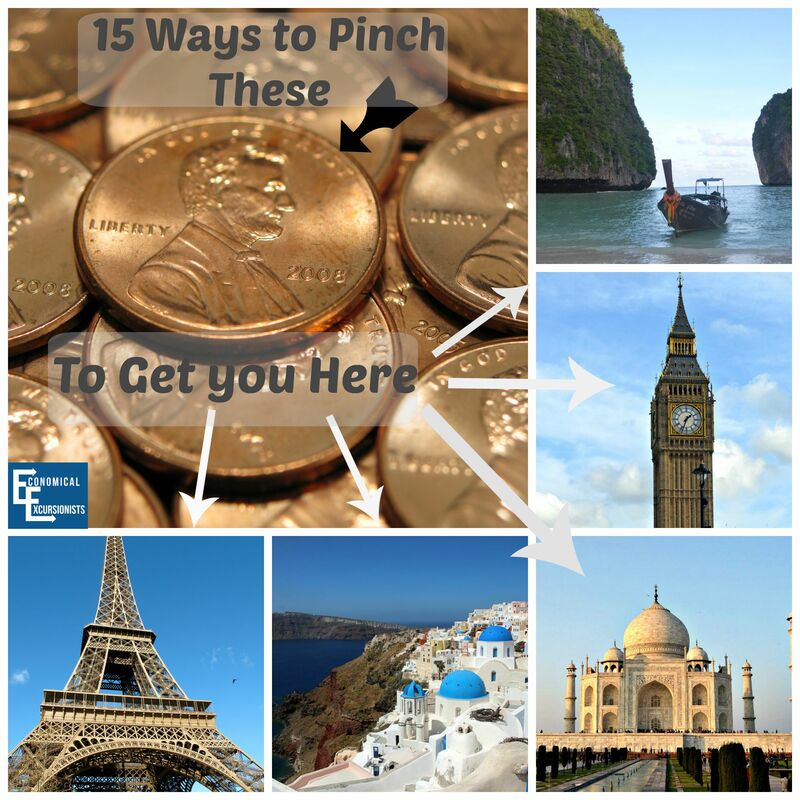 An upcoming post will be about specifically saving money while traveling, so stay tuned! Awesome tips on saving money. Now I want to hear how you save while planning trips!~!~! 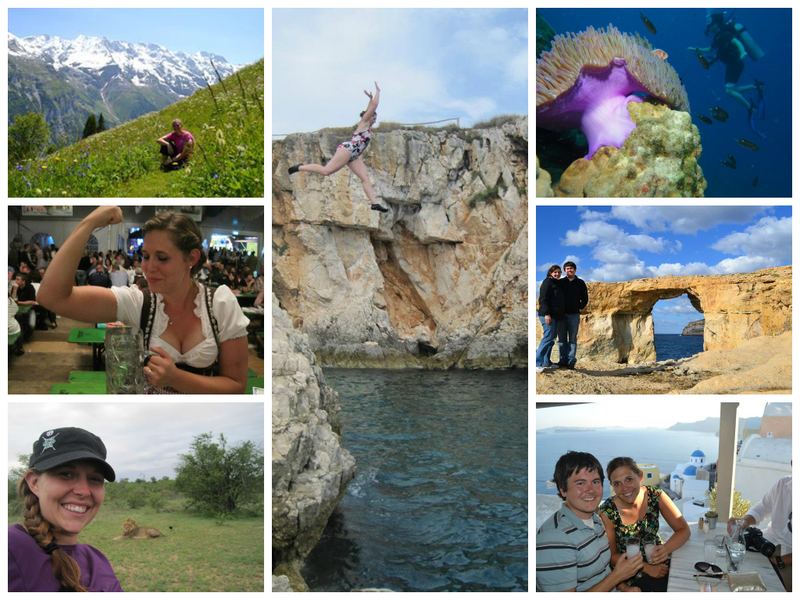 I never spent less than a few hundred (sometimes a grand) on a trip and I need to learn!~!~! Thanks, Kandace! Don’t worry, I have plenty on traveling tips. Get ready to start saving some money! Totally with you on the haircut money-saving technique though I need you to teach me how to give a men’s haircut or something because I am terrible at cutting Drew’s hair. there are a lot of great YouTube videos that have haircut tutorials. Great resource to use BEFORE you pick up the shears or clippers. And you do save a lot of money doing it yourself at home, I save over a grand a year cutting my children’s hair and having mine cut at home as well. My hairdresser doesn’t hate me, lol. He trims it for me every other month, and he will braid it for me as well. He does a Great job, convenient and free. Being you wear yours long and in a braid most of the time, you should give your guy the shears to let him pay you back for your services and have him trim your ends. Have him watch some YouTube tutorials first and be sure he understands the difference between a one inch trim and a six inch chop. If he doesn’t then I would not entrust him with the shears, but go DIY. Four years to grow your hair out. I know how you feel. The only reason I have been able to grow mine to elbow length is because my guy trims it less than 1/4 inch every other month keeping the ends even and doing S&D on my split ends. Before I met my guy he had a lot of experience with the shears. He had given hundreds of haircuts to female friends and his ex-wife over the years. He had one friend whose hair reached to her calves at her longest point and he would have to sit on the floor to trim it. He did end up taking her length up to her hips when she got tired of getting it caught on just about everything and told him to just cut it. He also did a few repair jobs on bad salon haircuts, so he had a lot of practice cutting a woman’s hair before he ever offered to do mine and I wanted to see what kind of shears he intended to use to cut my hair. He got out a leather case with high quality hair shears, so I said OK. If he had opened the drawer and took out kitchen shears, I would have said no way. I wouldn’t trust a $2 cheapie thing to cut my hair. My mom bought one of those trim comb things back in the 70’s. It hacked a chunk of his hair on the top, leaving short hairs sticking up. She threw it out after that. Thankfully she didn’t use it on my head. But I did get my share of bad haircuts growing up. I don’t know why cutting my bangs to 1/2″ was supposed to look cute. I thought I looked like a dork.